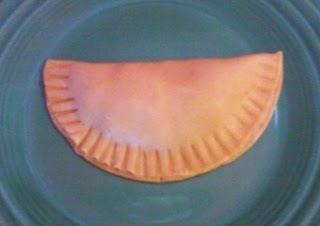 Every culture has their version of the "Meat Pie;" Empanadas, Pasties, Paztizzi... you could go on and on. These are great as an on the go meal and they are fantastic for parties and gatherings. They can even be made ahead of time and frozen before cooking. Below is my version of an Empanada Meat Pie. Don't let this long post intimidate you, I just wanted to make sure I covered everything and the several variations. (3) filling premade empanada dough. 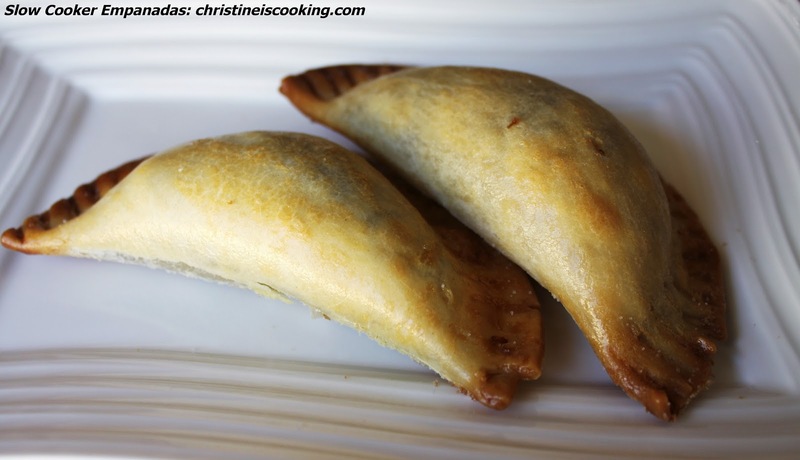 This recipe makes about 30 empanadas (more if you add diced cooked potato to your meat mix). Combine all the ingredients in a crock pot and cook on high for one hour and them move to low for 6 additional hours; for about 7 hours of total cook time or until the meat is cooked and fork tender. Remove the meat and let it cool. Strain the juices leftover in the crock pot and discard the solids, but save the drained liquids / beef broth.. You will need approximately 1 cup of the beef broth for the empanada filling. The rest of the beef broth you can use / freeze for other recipes or use it as a starter for soup. Shred the meat once it has cooled. Optional: you can stretch this recipe by adding a few cups of diced boiled potato and/or peas to your empanada filling as well. In a large sauce pan over medium heat, add the oil, onions, garlic and salt. Cook them until they are soft, but not browned. Add the remaining ingredients and stir. Simmer over low heat until the broth is reduced and the mixture is thickened (about 10 minutes). Add additional broth, if needed. The filling should be slightly moist, but not overly wet. Remove from heat and let cool at least an hour before making the empanadas. You can refrigerate this and make them the next day if you like. You will need you meat filling, 30 premade Goya Empanada Discs (check your grocer's freezer), a small bowl of water, a fork (and eggs, vegetable oil, a cookie sheet and Silpat or parchment paper for baking). (1) Using clean hands, dip your fingers in your water bowl and wet the outer 1/2 inch of the disc. 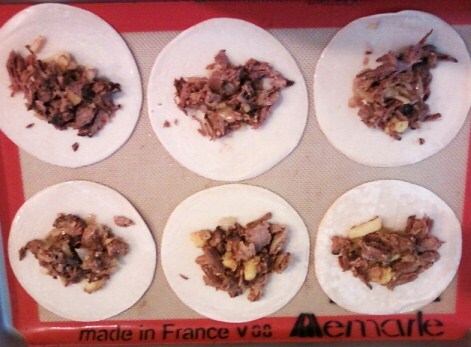 (2) Add about 2 tablespoons of the beef mix to the center of each dough disc. (3) Fold into a half moon shape. Using a fork, crimp the edges of the dough together. Once you empanadas are assembled you can pan fry, deep fry or bake them. (3) Brush the empanadas with a beaten egg. I prefer to use a OXO Good Grips Silicone Pastry Brush. 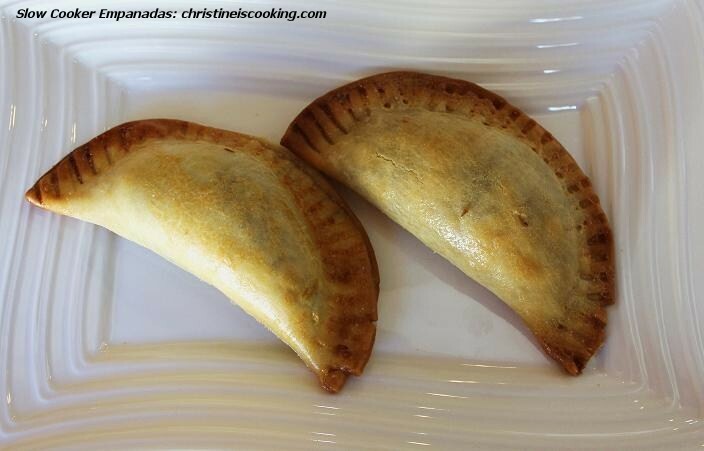 (5) Quickly remove the empanadas and brush them with vegetable oil and a small dash of salt, Return the empanadas to the 350 degree oven for 10 minutes or until golden brown. Serve alone or with seasoned sour cream. These are also great cold the next day. Place the uncooked empanadas in your freezer on a cookie sheet. Once they are frozen transfer them to a freezer bag and freeze as shown here http://www.christineiscooking.com/2011/07/freezer-burn-saving-your-food-without.html . To bake frozen empanadas, Just thaw them in the fridge, brush with egg and later oil and cook them per the normal instructions. (1) Cook them on a Silpat baking sheet for 15 minutes at 350 degrees. (2) Brushed them with a beaten egg and cook for 5 additional minutes. (3) Brush them with oil and cook them for 10 additional minutes or until they are lightly golden brown. I first saw Martha Stewart praising a Silpat over a decade ago and had to have one. A Silpat is a silicon liner made in France that turns any pan into a non-stick surface without overly browning your food (like oil can do). It is great for making candy, cookies and chicken wings. Baked on food just slides right off of it. 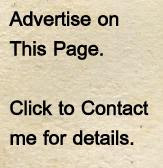 I have used the same Silpat silicon liner for over 10 years. They seem to last forever. I highly recommend it.